Our team of experts will work with you to map out the strengths and weaknesses of your case. 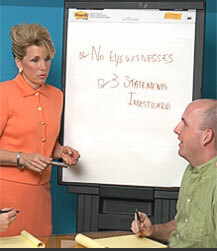 Using a team approach, we use the evidence to cultivate a compelling theme that engages jurors and mediators alike. We conduct case theory and analysis in the context of the fluid events and people who ultimately will pass judgment on your case to develop a theme that will work for your case. A powerful theme is essential for engaging your audience, organizing the vast amount of evidence that is presented, and appealing to the trier of fact to do what is right and just. In order to win, your theme must become the anchoring story for the jury while stirring them to want to do what's right. Our focus groups, mock trials, and public opinion surveys will guide you as to what will sell and what won't, and show you what works.